Last week was really quite lovely. Late Wednesday afternoon I drove out to Sunset with Jae, and the next day we feasted with Grace and Chekhov, and Savannah Sly and a couple of her friends joined us. 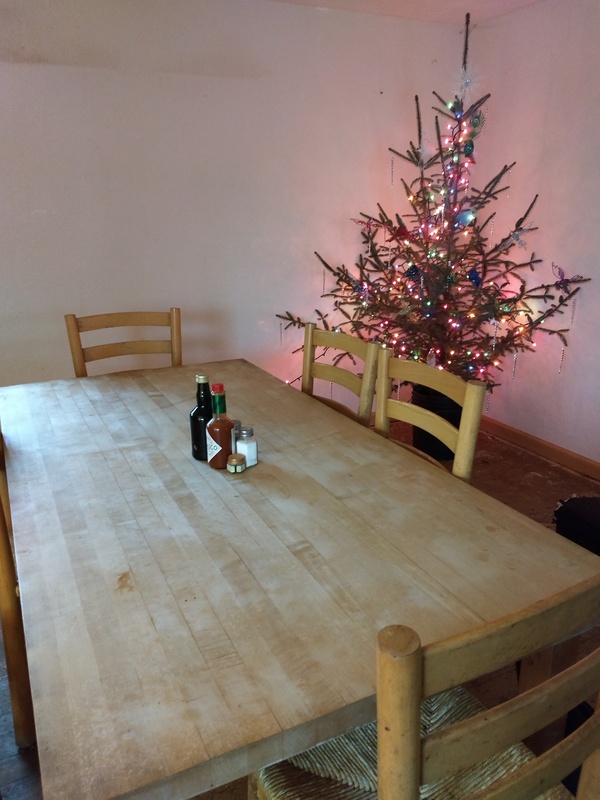 It was the first time I’ve been able to present a proper sit-down holiday feast in my own place since the early 90s; every other place I’ve lived since then hasn’t had an actual dining room, therefore no place to serve sit-down dinners. That may seem a small thing to some of you; after all, I’ve owned relatively-large (compared to most people I know) parcels of land for 16 years now, so you’d think I could’ve had a simple dining room. But somehow, it has never worked out that way; my attempts to build my own house resulted in failure, and my apartment in Seattle is cozy, but too small for a proper table. So having one now is a kind of sign that I’m going in the right direction at last: the house at Sunset wasn’t a dream home, but it’s serviceable and getting nicer by the week. After the floor is leveled Grace will be building bookshelves, and Jae is working on the decor for me. On Friday I walked the newly-cleared fence line and discussed the fencing project with Chekhov, and we even found a tree to bring inside for Christmas. And every time I go, I get a few more of my books out of boxes and onto temporary shelving. It’s not perfect, but it’s progress. And that’s the most I’ve been able to say about my home in a very long time.